The war in Syria has been responsible for many of the high number of deaths in wars in recent years. There has been an alarming upward trend in the number of deaths in war around the world since 2012. The Stockholm International Peace Research Institute concludes that in the first decade of the 21st century, the total number of deaths from organised violence worldwide stabilised at around 35,000. But, by 2014, it had multiplied to 130,000. The small decline to 118,000 in 2015 didn’t reduce the severe global anxiety about armed conflict. Half of this shocking increase was due to the war in Syria, and much of the rest to the spread of Islamic State (IS). In 2015 the number of state-based conflicts increased steeply to 50, up from 41 in 2014. This is the second highest number since 1945, due almost entirely to IS’s expansion. 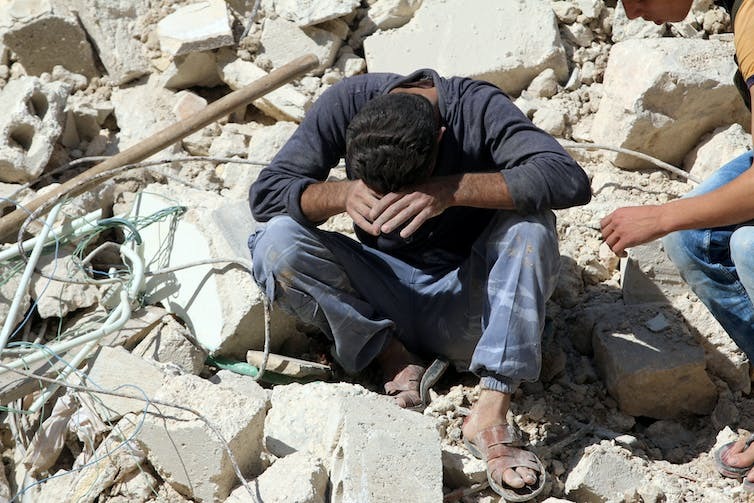 However, the Syrian and IS wars are not the causes of the violent conflicts in the 23 other countries. In 2015, war was causing more than 25 battle deaths a year in these countries. They included Azerbaijan, Afghanistan, the Central African Republic, Colombia, Congo, India, Kenya, Mali, Pakistan, Philippines, Russia, Somalia, South Sudan, Thailand, Turkey, Ukraine and Yemen. Nor is IS the cause of conflicts in many areas where major violence has not yet erupted, but where it occurs spasmodically or is threatened. These include Burundi, Georgia, Israel and Palestine, Nigeria, Sudan, Western Sahara, and places where terrorists are active. Neither do these include those situations where participants and observers consider there is a serious possibility of conflict erupting, and where efforts to ease conflict could be of great value. These include Bougainville, the East China Sea, the Korean Peninsula, Myanmar, the Solomon Islands, the South China Sea, and West Papua. Violent conflict is causing explosive growth in numbers of forcibly displaced people worldwide, numbering 65.3 million in 2015. This is the largest number on record. Of these, 21 million are refugees, more than half of whom are under 18. … peace is not being well served by national governments or the array of international institutions, forces and instruments that are currently devoted to enhancing security and international stability. … the priority of everything we do together [must be] preventing conflict and sustaining peace. … we spend far more time and resources responding to crises rather than preventing them. It has proved very difficult to persuade decision-makers at national and international level that prevention must be their priority. Therefore, strengthening and professionalising capacity for peacemaking is vital. … significantly reduce all forms of violence and related death rates everywhere. Australia therefore shares in the global commitment to implement more effective means of peaceful conflict resolution. The question is: how could Australia do that most effectively? For the last year, the University of Melbourne’s Australian International Conflict Resolution Project has been studying how seven other countries prevent conflict and build peace. The countries studied have been Canada, Malaysia, New Zealand, Norway, South Africa, the UK and the US; the most detailed attention was given to Canada, Norway and the UK, because they focus substantial attention onto peace processes. The conclusions focus on possible lessons and recommendations for Australia in how best to respond to conflicts and support peace processes. reference to an international judicial tribunal. More training in the range of conflict resolution skills such as mediation would be highly valuable. Action to resolve or prevent conflict at an early stage is far more cost-effective than attempts to resolve, restore or repair once violent conflict has erupted. To maximise the long-term effectiveness of Australia’s foreign policies, there would be great value in strengthening Australia’s conflict prevention and resolution capabilities. Aiming to strengthen security is a fundamental goal for the process of development. Australia cannot be secure unless the countries in our region also feel secure. It is essential for Australian security that we seek and support additional ways of contributing to the peace and justice in the region and globally. Why is Islam so different in different countries? The rise of Islamic State has led to much speculation about the group’s origins: how do we account for forces and events that paved the way for the emergence of the jihadist group? In the fourth article of our series on the historical roots of Islamic State, Aaron Hughes explains the amazing regional variation in Islamic practice to illustrate why Islamic State appeared where it did. No religion is unified. How Catholicism, for example, is practised in rural Italy differs from the way this is done, say, in New York city. Language, culture, tradition, the political and social contexts, and even food is different in these two places. Such geographic differences are certainly important in Islam. But also important are the numerous legal schools and their interpretations. Since Islam is a religion predicated on law (sharia), variations in the interpretation of that law have contributed to regional differences. Also significant in the modern world is the existence of other religions. Malaysia, for example, has a relatively large percentage of religious minorities (up to 40% of the population). Saudi Arabia has virtually none. This means Malaysia has had to develop a constitution that protects the rights of religious minorities, whereas Saudi Arabia has not. And it’s why Islam is so different in these two countries. There are historical reasons for this variation. Despite popular opinion, Islam didn’t appear fully formed at the time of Muhammad (570-632). There were huge debates over the nature of religious and political authority, for instance, and who was or was not a Muslim. It’s similarly misguided to assume that a unified teaching simply spread throughout the Mediterranean region and beyond. How Muhammad’s message developed into the religion of Islam — complete with legal and doctrinal content — took centuries to develop and cannot concern us here. What is important to note, however, is that his message spread into various (unbordered) regions. Modern nation states would only arise much later. And each of these areas was already in possession of its own set of religious, legal and cultural traditions. The result was that Islam had to be articulated in the light of local customs and understandings. This was done, in part, through the creation of legal courts, a class of jurists (ulema; mullas in Shi`ism), a legal code (sharia) and a system of interpretation of that code based on rulings (fatwas). Many local customs arose based on trying to understand Muhammad’s message. And these customs and understandings gave rise to distinct legal schools. Although there were originally many such schools, they gradually reduced to four in Sunni Islam – Hanafi, Maliki, Shafi`i and Hanbali. While these four schools all regard one another as orthodox, they nevertheless have distinct interpretations of Islamic law. Some of their interpretations are more conservative than others. There are also a number of such schools in Shi`i Islam, as you can see from the image above. 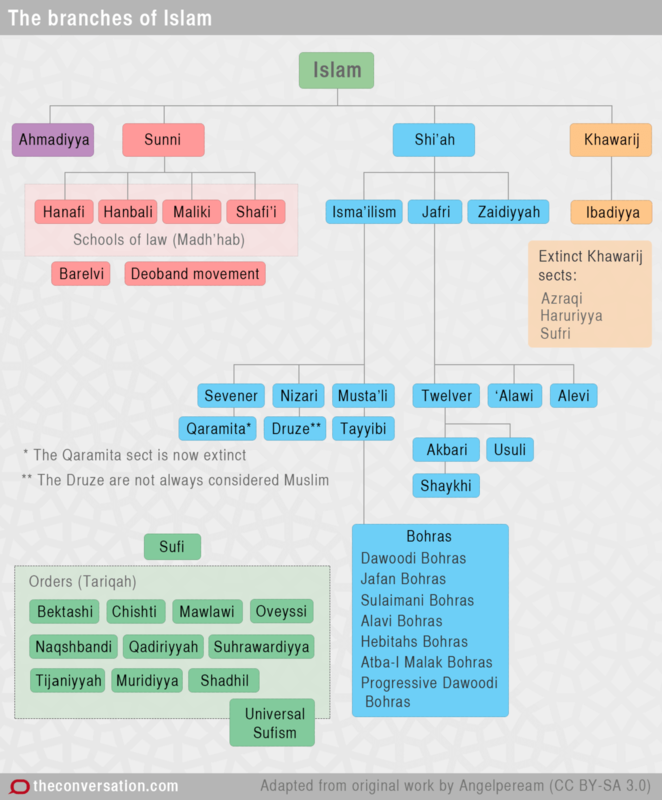 The four Sunni schools are associated with distinct regions (as are the Shi`i schools). The Maliki school, for example, is prominent today in Egypt and North Africa. 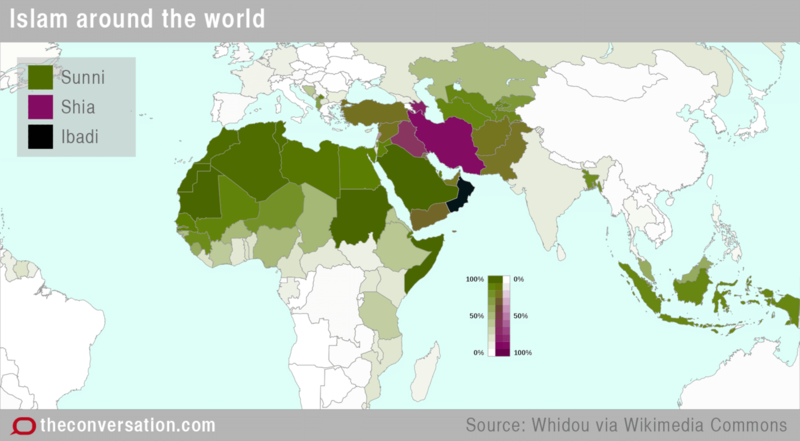 The Hanafi is in western Asia, the Shafi`i in Southeast Asia and the Hanbali (the most conservative) is found primarily in Saudi Arabia and the Persian Gulf states. All this legal and local variation has produced different interpretations of the religion. But despite such regional and legal diversity, many Muslims and non-Muslims insist on referring to Islam and sharia as if they were stable entities. An example might be illustrative of the extent of the differences within Islam. Many non-Muslims are often surprised to learn of the cult of saints, namely the role Sufi saints (Sufism is Islamic mysticism) have played and continue to play in the daily life of Muslims. A Sufi saint is someone who is considered holy and who has achieved nearness to God. Praying to these saints and making pilgrimages to their shrines is a way to, among other things, ask for intercession. Although these practices are not unlike the role and place of saints in Catholicism, in Islam they are much more localised. And this locally varied cult of saints played and continues to play an important role in Islamic religious life from Morocco in the West to Pakistan in the East. Devotion to the saints is believed to cure the sick, make fertile the barren, bring rain, and so on. Needless to say, such devotion is often frowned upon by more fundamentalist interpretations. While most legal schools are content – albeit somewhat bothered – by such practices, the conservative Hanbali school forbids cults like this. Its adherents have, among other things, destroyed tombs of saints in both the premodern and modern eras. They have also been responsible for the destruction of shrines associated with Muhammad’s family, such as the shrines and tombs of Muhammad’s wife. The Hanbali school, backed by the wealth of the Saudi ruling family, has also tried to make inroads into other areas. Those associated with this legal school, for example, have built madrasas (religious seminaries) in regions traditionally influenced by other legal schools of thought. Most fundamentalist movements in Islam, including Islamic State, have emanated from such ultra-conservative elements. The Taliban in Afghanistan and Pakistan, for instance, are influenced by the more conservative elements of Hanbali ideology, even though they exist in a predominantly Hanafi legal environment. The goal of many of these groups, sometimes referred to as Wahhabis or Salafis, is to return to what they imagine to be the pure or pristine version of Islam as practised by Muhammad and his earliest followers. They often have strict interpretations of Islam, strict dress codes and separation of the sexes. Today, there are more than one and a half billion Muslims worldwide, making Islam the second-largest religion on the planet after Christianity. But it is a rich and variegated religion. And this variation must be taken into account when dealing with it. Most importantly, the variation cannot be papered over with simplistic slogans or stereotypes. That women are not allowed to drive in Saudi Arabia but are in places like Malaysia tells you something about this variation. This article is the fourth in our series on the historical roots of Islamic State. Look out for more stories on the theme in the coming days. The video below is a program that investigated whether western intervention in other countries is/has been a good thing – what do you think? Is the program right in its conclusions? The link below is to an article that highlights the 50 worst countries to live in in terms of being persecuted for being a Christian.